Earlier this month two friends and I put on a special Soup Night in my home. It was a fundraiser for a local nonprofit that supports people living with AIDS and HIV, and it was a smashing success, in every respect. And because it seemed appropriate to make everything look special, I turned to my very talented sister to make floral arrangements. I’m not good at that, but I’m very good at knowing who to call on. First problem: Where to find flowers in November? Alice is not deterred by a silly little problem like that. 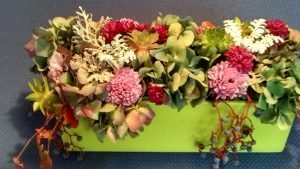 Instead, she looked around and, using elements from both our gardens and some friends’ too, created arrangements that celebrate Mother Nature in autumn. The results were stunning. One of her creations features leaves and berries from nandina. It’s a little tribute to our mother, who always grew these lovely shrubs, principally for the berries (birds love ‘em) and the gorgeous fall foliage. 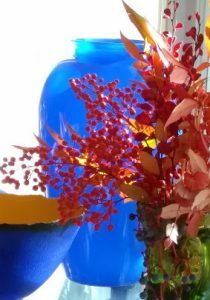 This looks especially nice against my blue vase and bowl (blue and orange are complements on the color wheel, and always look good together). And sunshine through the window sets it on fire. This long arrangement, a centerpiece for the main table, includes the silvery leaves of dusty miller (from the garden of our friend Martha) and flower snips from my hydrangea. 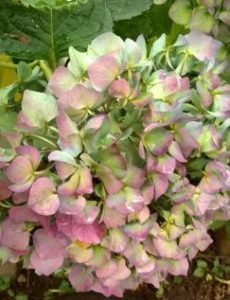 Some of you may remember me sharing the story of starting this hydrangea from a cutting from my mother’s plant. In late spring it is a knock-your-socks-off cobalt blue, but in the heat of midsummer the flowers turn a soft blue-green. Then, the cooler temperatures and shorter days of autumn bring another palette change: the edges of the blossoms become this lovely purply pink.